“Apá was a strong still oak. We hid under his branches like shadows. Even when he laughed a thunderous laugh, those branches shook only ever so slightly,” Martinez writes. Chela Gonzales is about to start sixth grade, the last year of elementary school, when her beloved father suffers a stroke. Her grandmother comes to stay, and Chela realizes that old lady perfume smells like bad news. She and her brothers and sister miss a week of school while her father is in the hospital. When he comes home and Chela returns to school, her best friend Nora has “mutated into a popular girl” and isn’t speaking to her. Because she has no friends at school, Chela spends her free time with Apá, helping him build their new house and practicing for the school soccer tournament. Eventually, after proving that she is smart and good at soccer, Chela is recruited to join Nora, Camila, and the other popular girls. During Easter break, her dad has another stroke, and doesn’t recover. Back at school, the popular girls show off their new outfits and brag about their vacations, while Chela hides the fact that she spent her break in mourning and attending her father’s funeral. Only Nora and their friend Roy know the truth. 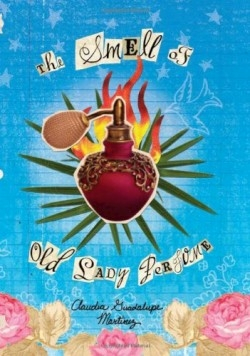 The Smell of Old Lady Perfume is a touching story that will teach lessons on loss, family, loneliness, and the importance of being oneself. Not only does Chela deal with the pains of growing up—wearing a bra for the first time and discovering what the “napkins” under the sink are for—but she has to do it without friends to confide in. Chela’s school year ends on a happy note; she is rewarded for her academic achievements and she and Nora break away from the popular crowd, who weren’t very good friends anyway. But young readers will see that nobody’s life is perfect and that with happiness often comes pain. The author’s own father died when she was eleven. This is her first book. The novel’s easy language reads like genuine narration from a sixth grader and complements the story’s complex themes. Young readers will also learn Spanish words and phrases including abuelita (grandma), Si se puede (yes, you can), and even sapo verde (green toad). They may be tempted to try dishes like stuffed peppers with tortillas and the chocolate drink champurrado. After the All-School Awards ceremony, Chela accepts that her father isn’t coming back, but she is comforted by the memories of their time together and the love he always showed her. “Seventh grade, eighth grade, the first day of high school, college, and many more days would come. It was okay,” she says.